A nerf to the X-4 Stormwing is confirmed. Fortnite’s 7.10 update is likely coming on Tuesday or Wednesday. It will be the second update since the release of season seven. Developer Epic Games has already revealed part of the changes coming with it. The Infinity Blade nerf that would come in 7.10 is probably canceled since the company removed the blade from the game last Friday, unless it returns in a new Limited Time Mode. But complaints about changes and additions in 7.01 already made Epic announce adjustments to the X-4 Storming plane for the 7.10 update. Epic Games community coordinator Sean “MrPopoTFS” Hamilton said last Thursday that the damage players take on the plane X-4 Storming when it’s taken down and explodes will increase to 50 instead of the current 25. That will make the plane a less safe method for players with low health to survive until later stages of the game. If Epic is adjusting the plane, it’ll probably fix some bugs listed in the Fortnite Community Issues board. 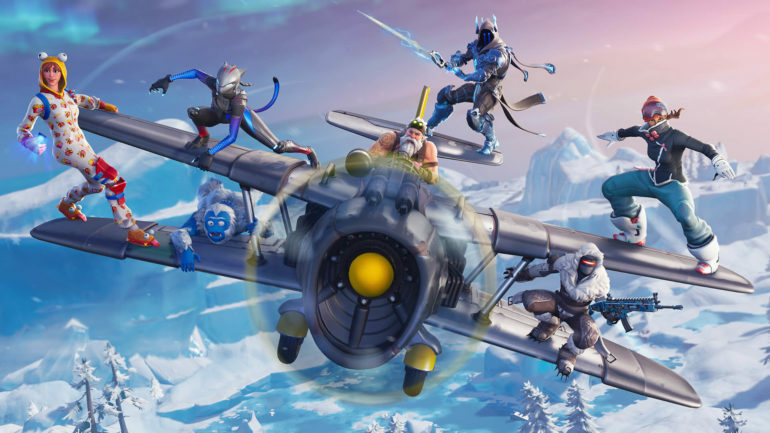 Epic found that bugs ranging from character models to custom keybindings disrupting the plane’s movement are present in the game’s current version. And these are not the only bugs Epic can fix in 7.10. Players found last week that shotgun bullets are apparently not being registered by the Fortnite server many times, which makes players miss shots and deal less damage with these weapons. Streamer Ali “SypherPK” Hassan was one of the first to bring up that issue. Fortnite professional player for NRG Sven “Svennoss” also complained of shotguns staying zoomed in without holding buttons and of some pellets hitting opponents randomly. Epic announced a new snowboard vehicle called Driftboard, which should be added as soon as 7.10 is live. “Hop on board and boost past your competition with this new single player vehicle,” the message about the item in the in-game News tab reads. We still have no clue about how the Driftboard will work. Epic is enforcing its Terms of Service against dataminers. The company allegedly threatened legal action against a Fortnite leaker last Thursday. This comes a few weeks after other leakers were either banned or quit the game due to Epic’s actions. If we still get cosmetics leaks after the 7.10 update, they should come from individuals instead of big- to medium-sized websites specialized in Fortnite leaks. The recent Team Rumble and the returning Close Encounters Limited Time Modes could rotate out of Fortnite: Battle Royale. Team Rumble has been around since the last update of season six on Nov. 27, and Close Encounters was just added as part of the 7.01 update last Tuesday. New Limited Time Modes could replace them. Epic is yet to announce if any of them are leaving soon, as the company usually does in these cases. Fortnite players will discover early in the morning of Tuesday or Wednesday what’s coming in the 7.10 update.